I have just finished this beautiful kitchen set in different colours. 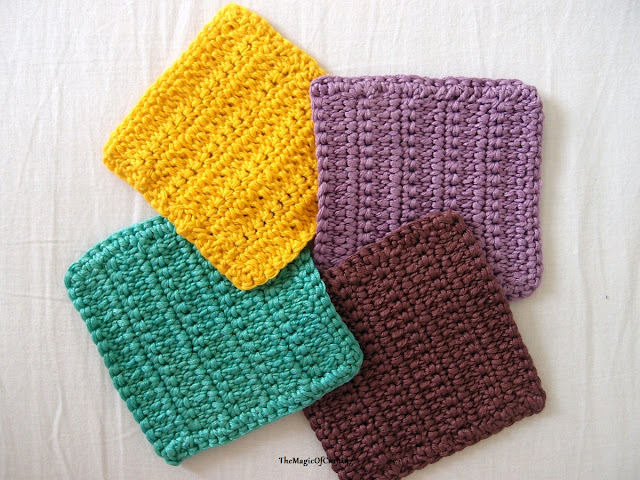 It is a fast crochet project where you can use the scrap yarn you have from other projects. 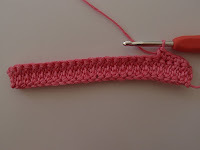 Yarn: 100% cotton. 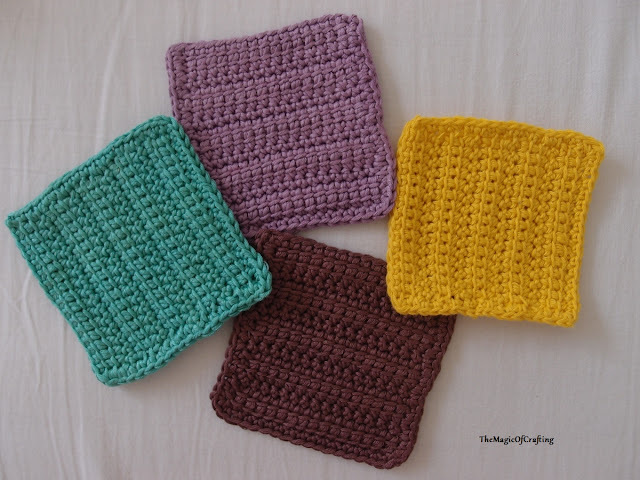 You can use any yarn, however the cotton is the most suitable for the kitchen - it absorbs well and can be washed in washing machine on high temperature. 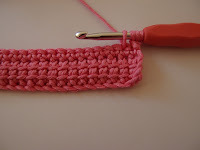 The linked treble crochet(LTR) is very easy stitch. 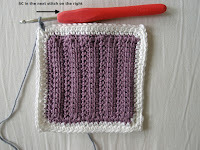 There is detailed photo tutorial below how to make it, you may also check this post "How to Make Linked Treble Crochet". 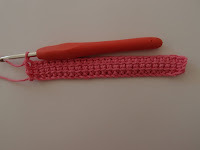 Reverse single crochet is also very easy - it is just single crochet stitch but from left to right, check the photos in the pattern on how to make it. 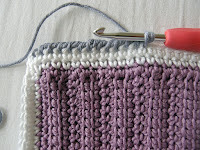 Colours used - one for the base solid square, white for the inner border and grey for the outer border. 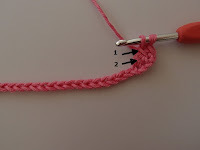 Row 1:Ch 19, insert the hook in the second ch from hook and pull a loop, then do the same for the next 2 chains (4 loops on the hook). Now finish like a normal tr - yo, pull through two loops, yo, pull through two loops, yo and pull through the last two loops. First LTR st made. 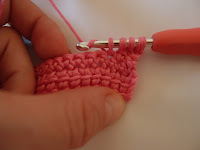 Now for the next - insert the hook in the first horizontal loop of the ltr you just made and pull a loop, do the same for the second horizontal loop and pull another loop, next insert the hook in the next ch and pull a loop - 4 loops on the hook. Finish like normal tr - yo, pull through two loops, yo, pull through two loops, yo and pull through the last two loops. 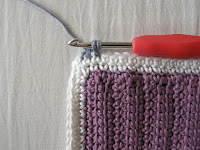 This is the second ltr, now make ltr till the end of the row (16 st). Turn. This a row of sc st.
Ch 1, sc in same st, sc in the next st and in each st till the end of the row (16 st). Turn. Ch 3, insert the hook in the second ch from hook and pull a loop, then insert the hook in the 3rd st from hook and pull a loop, insert the hook in the first st and pull a loop (4 loops on hook), finish like normal tr - yo, pull through two loops, yo, pull through two loops, yo and pull through the last two loops. First LTR st made. 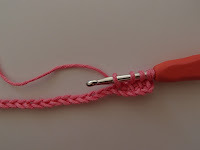 Insert the hook in the first horizontal loop of the ltr and pull a loop, then insert it in the second loop and pull another loop, insert the hook in the next st and pull a loop (4 loops on the hook). Finish like normal tr. Make on ltr in every st till the end of the row (16 st). Turn. Row 4, 6, 8: Repeat row 2. Row 5, 7, 9: Repeat row 3. 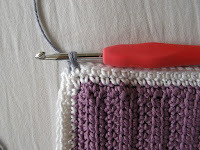 Do not cut the yarn yet. 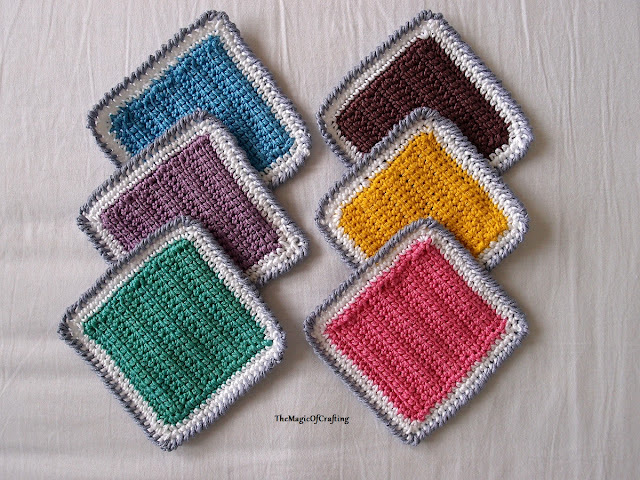 Make a round of sc all around the square, then cut the yarn and weave in the ends. 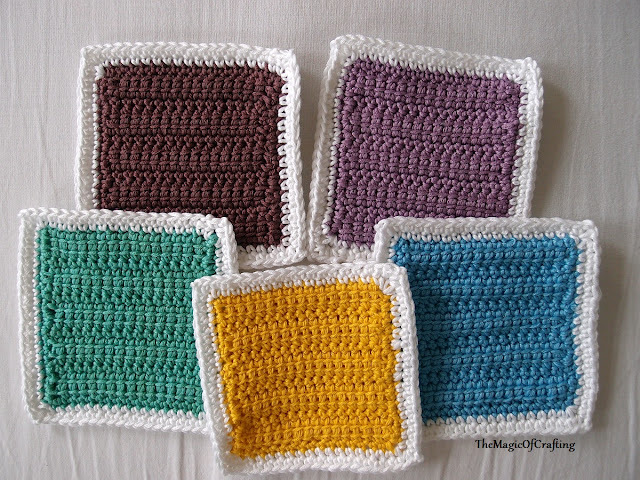 Row 1 (white): Ch 1 and make a row of sc with white all around the square. 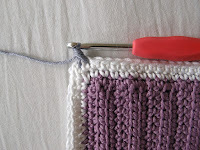 Work *sc, ch, sc* in the edge stitch, sc in each other st. End with ss in the first ch. Row 2 (white): Ch 1, make a second row of sc with white around the square. Work *sc, ch, ch, sc* in each of the 4 edges. Finish off with ss in the first ch. 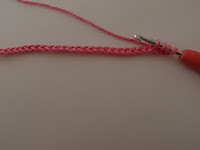 Cut the yarn and weave in the ends. Ch 1, sc in the same st. Now make a round of reverse sc - instead of going to left your next st is the stitch to the right ( this way ---------->). At the edges make losely rsc, ch, ch, rsc. 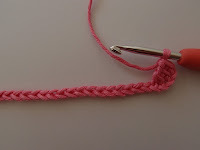 End with ss in the first chain.